We all like to be accepted by our friends and classmates. It is such a good feeling to know that someone loves you and accepts you just as you are! But there is something more important than being loved and accepted by other people. What is it? It is being loved and accepted by God! God did something wonderful for me when I took the Lord Jesus as my Savior! He made a way for me to be perfectly accepted by Him at all times. How did God make me acceptable to Him? He put me in Christ. The moment I trusted the Lord Jesus as my Savior, God put me in Christ. What does it mean to be in Christ? It means that I have a new "position" in God's sight. My position is the way God sees me. How does God see me now? He sees me in Christ. When He looks at me, He is thinking about His beloved Son. He always sees me in Christ. How did I get in Christ? God put me there! The Bible says, "But of Him [God] are you in Christ Jesus…" (1 Corinthians 1:30). Here are some verses that tell us of our new position in Christ. God not only put me in Christ, but He made me a new person in Christ. The Bible says, "Therefore if any man [anyone] is in Christ, he is a new creation [a new person]: old things are passed away; behold, all things are become new" (2 Corinthians 5:17). I still have the same body, but God has made me a new person on the inside. God wants every believer to know that he is in Christ. God wants us to know that He loves and accepts us in Christ the same way that He loves and accepts His own beloved Son. 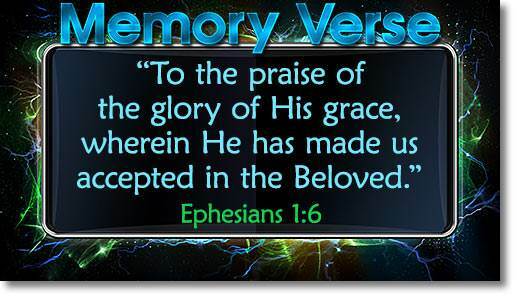 The Bible says, "…He has made us accepted in the beloved [His beloved Son]" (Ephesians 1:6). The following story may help us understand what it means to be "accepted in the Beloved." This is an illustration of what God has done for me. The moment I took the Lord Jesus as my Savior, God put me in Christ. 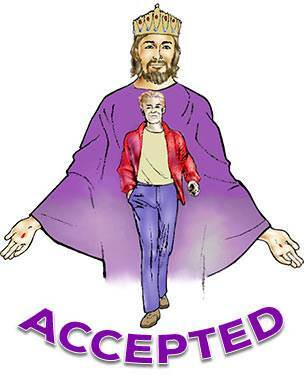 Now I am loved and perfectly accepted by God at all times. 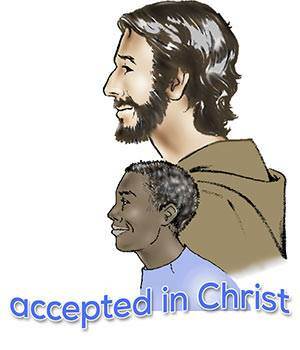 God has made me accepted in His Beloved Son. Because I am in Christ, God is for me! This means that God always wants what is best for me. When something bad happens to us, our enemy Satan may say to us, "God does not love you! If God really loved you, He would not have let that happen." But Satan is a liar! The truth is that God is working all things together for the good of those who love Him and love His Son. The Bible says, "We know that all things work together for good to them that love God…" (Romans 8:28). You may ask, "What if some people are against me?" If God is for us, it does not matter who is against us. The Bible says, "If God is for us, who can be against us?" (Romans 8:31). God is for me! That is what counts. Say it to yourself right now, "God is for me!" "What if some people do not accept me?" Being loved and accepted by God is far more important than being loved and accepted by other people. 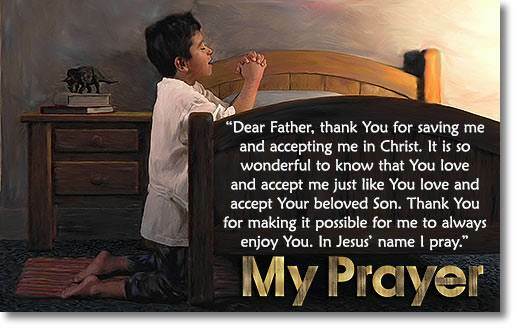 God is for me and accepts me at all times because I am in Christ. He is always thinking of me. "What if some people do not love me?" Remember, the Lord Jesus loves us, and the Father loves us. Every believer can say, "God loves ME! 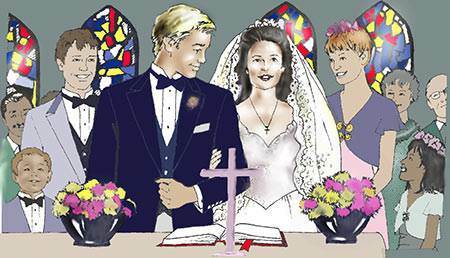 He loves me in a special way because of my love for Jesus which He has put in my heart." The Lord Jesus said, "The Father Himself loves you, because you have loved Me…" (John 16:27). Once I am in Christ, I am always in Christ, but sin breaks my fellowship with God. What should I do? I should confess that sin to God at once and ask Him to forgive me. When I do this, my fellowship with God is restored. God put me in Christ. God did the most wonderful thing for me when I was saved! He put me in Christ! This means that, when God looks at me, He sees His beloved Son. God accepts me in Christ! Because I am in Christ, God loves and accepts me just like He loves and accepts His own beloved Son. God is for me! Because I am in Christ and I love God's Son, God is always for me. Since God is for me, it does not matter who is against me. Maria and Susan meet their camp buddies, Maggie and Nancy. Maria comforts Maggie after Nancy insults her. Maggie's counselor, Miss Amy, was very understanding. She had a joyful laugh that cheered Maggie up. "Maggie," she said, "come with me, and I will show you something. Every year, kids leave clothes at camp. We store them in a closet for anyone who might need some extra clothes at camp. The closet is stuffed, and I am sure we can find a few things that will be just right for you. At the end of the week, you may take them home with you." Maggie's face lit up as she and Miss Amy went over to the camp office. Maria decided she would look for her brother. She wondered what had happened to him during his first day at camp. 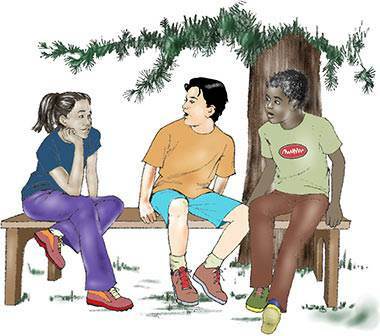 It did not take long for her to find Steven and Randy sitting under a big tree. They looked very serious. "What happened?" Maria asked curiously. Steven looked up at Maria and said, "Something really bad has happened. We were just talking about it. Sit down and we will tell you." "Steven, are you having trouble with your buddy, Pete?" Maria asked. "Shh! Not so loud," Steven said with a low voice. Then he continued, "I think Pete is okay, but I don't know for sure. I went to his cabin to help him unpack. He was mad because his 'old man'—that is what he calls his father—did not give him any spending money. "I decided to go get some of my money to give to him, but when I got back he was gone. The only one there was a boy named Bobby in the next bunk, and he was crying." "Oh, no! Was he homesick?" Maria asked with sympathy in her voice. "No, worse than that," Steven shook his head and went on. "Someone had taken some money out of his suitcase." "Do you think Pete took Bobby's money?" asked Maria. "Right now, it sure looks like it," Randy answered. "Steven and I are trying to figure out what to do. We were talking about the golden verse that Mr. Douglas explained to us earlier, and we do not think it would be fair to accuse anyone of stealing until we know for sure." "I guess anyone in your cabin could have taken Bobby's money and nobody would know who it was," Maria said with concern. "I agree, Maria," Steven responded. "I will never get to know Pete if I doubt him right from the start. "The problem is that I do not think he is a Christian by the way he was talking. He said some bad words and complained about having to learn the Bible verse. "I was also wondering if Jesus would want me to go and say anything to our counselor, Mr. Ken. I am afraid that Pete will find out and get mad at me. Then I will not be able to talk to him about Jesus." "Wow! For the first day at camp you are in a real mess, Steven," Maria exclaimed. She went on, "You need to be really sure and have proof before you accuse Pete of taking the money." "We might have some proof," Randy added. "When Steven was getting some money to give to Bobby, I saw Pete at the snack bar buying ice cream with Biff Franklin. I know Biff, and he is not a good guy to have as a friend. He has visited a family down the street where I live and has caused a lot of trouble. "We have to find out how Pete met Biff and where Pete got the money to buy ice cream. When we have the answers to those questions, we will have proof and can tell Mr. Ken." Just then the supper bell rang. All three campers jumped up at once. "We better hurry and get in line," said Steven. "We will try to find out more tonight. We will see you tomorrow morning and give you any news." The next morning, when breakfast was over, Steven and Randy found Maria and Susan at the beach. Maria had told Susan about the missing money, and both girls were eager to hear more about it. "What did you find out last night?" Maria asked. "Not much," Steven said shaking his head. "When I asked Pete where he got the money for the ice cream, he changed the subject. But things are getting more mysterious all the time." "What do you mean?" the girls asked at the same time. Randy began to share with the girls, "My buddy, Joey, has his bunk next to mine. This morning, when we were supposed to be reading our Bibles, Joey was reading a dirty comic book. When he saw me, he put it under his pillow. "When I asked him about it on the way to breakfast, he said he bought it from Pete, and a lot of the other guys bought some, too. We are not supposed to have things like those comic books at camp. We don't know where Pete got them or why he was selling them, but that would explain how he got money to spend." "Did you tell your counselor about Bobby's missing money?" asked Susan. "No, I did not, but Bobby told him," Steven answered. "Mr. Ken told everyone in our cabin that the missing money would be a mark against the whole cabin unless someone admitted stealing it. No one has said anything yet." Where did Pete get the comic books to sell? What will Steven do about Pete? Find out what happens in your next lesson.